The most beneficial surgery to correct a patient’s vision depends very specifically on the patient. Age, types of glasses being used and desired outcome all come into play as surgical decisions are made. There are essentially two categories of procedures which can be considered: Laser Vision Correction (LASIK, LASEK, PRK) and Implant Vision Correction (phakic Intra-ocular lenses, refractive lens exchange with ReStor or ReZoom). 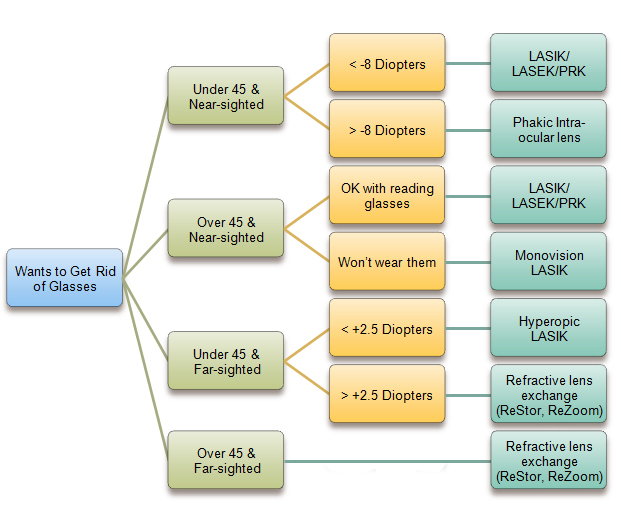 presbyopia (need for reading glasses). Since everyone has different eye characteristics, Dr. Klein will determine during your consultation which vision correction procedure may be best to correct your vision disorder. Below is a rudimentary decision tree to determine what might be a good surgery.